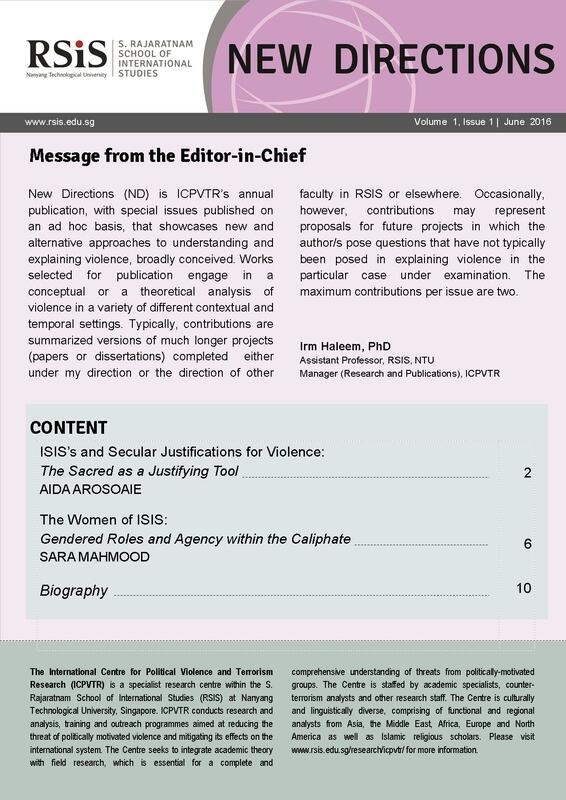 New Directions (ND) is ICPVTR’s annual publication, with special issues published on an ad hoc basis, that showcases new and alternative approaches to understanding and explaining violence, broadly conceived. Works selected for publication engage in a conceptual or a theoretical analysis of violence in a variety of different contextual and temporal settings. Typically, contributions are summarized versions of much longer projects (papers or dissertations) completed either under my direction or the direction of other faculty in RSIS or elsewhere. Occasionally, however, contributions may represent proposals for future projects in which the author/s pose questions that have not typically been posed in explaining violence in the particular case under examination. The maximum contributions per issue are two. Irm Haleem is Assistant Professor and Manager of Research and Publication at ICPVTR,RSIS, Nanyang Technological University. Her research focuses on a conceptual analysis of violence, with a focus on radical Islamist violence. She is the author of The Essence of Islamist Extremism (Routledge 2012, paperback edition 2014), as well as a number of other publications (papers, chapters, encyclopedia entries and book reviews). She is a member of the Board of Reviewers for the peer-reviewed journal Sociology and Anthropology. She has also served as the external reviewer for the peer-reviewed journals: Religions, Terrorism and Political Violence, and The American Journal of Islamic Social Sciences. In August 2015, Dr. Haleem was awarded a one-year research grant by the United States Air Force, Asian Office of Research and Development (AOARD), towards the completion of her second book: Death as Existence. Since joining in August 2014, Dr. Haleem has inaugurated and directed multiple theory workshops (ad hoc), Presentation and Research forums (monthly), and discussion groups. Dr. Haleem is the Editor-in-Chief of two ICPVTR publications: Quarterly Review and New Directions. Prior to joining RSIS at NTU, Dr. Haleem taught at Northeastern University (Massachusetts, USA), Seton Hall University (New Jersey, USA) and, most recently, Princeton University (New Jersey, USA). Aida Arosoaie was a Research Analyst with ICPVTR, RSIS. She has a BA in Politics and Hindi from SOAS, University of London, and a MSc in Strategic Studies from RSIS, NTU, where she wrote her dissertation, ISIS’s and Secular Justification for Violence: The sacred as a justifying tool, under the guidance of Dr Irm Haleem. Aida focuses on the conceptualisation of violence and discourse analysis of religiously-justified violent social movements by drawing on academic approaches from Sociology, Political Theory, Philosophy and Anthropology. Sara Mahmood is a Research Analyst for the Pakistan desk at ICPVTR, RSIS. Sara holds a MSc in International Relations, with a specialization in Terrorism Studies from RSIS, NTU. Sara wrote her Masters dissertation, The Women of ISIS: Gendered Roles and Agency within the Caliphate, under the guidance of Dr Irm Haleem. She has also participated as a presenter in the International Conference on Women and Jihad organised by the University of Western Australia. Her research interests include understanding the participation and role of women in violent movements, and the role of terrorism and extremism in the Pakistani state.